The safety of the occupants in a submersible is paramount. Therefore expansion of this aspect of SUBEO’s development is considered vitally important. Prospective purchasers can assess the unique systems used in Aquarius. 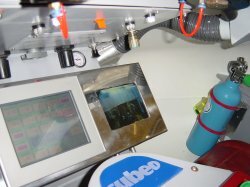 SUBEO has developed a comprehensive and modern system within its submersible design to ensure that the stringent safety codes and recommendations laid down by the classing authorities are met. For normal mission time, oxygen is delivered from small flasks within the cabin; the oxygen is metered and regulated by flow control valves. The concentration of oxygen is kept between 18 and 22%, and monitored by the main PLC (programmable logic controller) and a separate PLC dedicated to life support monitoring. Carbon dioxide is removed during the mission by a scrubber unit containing “Sofonolime” absorbent. The concentration of CO2 is monitored by the two PLCs. The levels of O2 and CO2 are displayed on the craft’s main information touch screen, and preset alarm levels are indicated by visual and audible alarms. The classing authorities require a life support system capable of keeping the occupants of the craft alive for 72hours. The requirements for O2 during the emergency period are supplied by POGs (Personal Oxygen Generators); these units are similar to the equipment used in commercial airlines to supply oxygen in the event of depressurization. This type of system is foolproof and does not rely on large O2 bottles and associated pipework, which could corrode. 3 emergency scrubber units perform carbon dioxide removal during the emergency period. These units contain integral blowers, batteries and absorbent. They are initiated by the removal of a sealing strip on the top of the units. These units are used in military submarines and further detailed information cannot be disclosed. During the emergency period monitoring of life support systems is carried out by a small slave PLC, to minimise energy drain. Individual breathing sets are supplied within the craft to enable each occupant to breath from a small compressed-air bottle. In the unlikely event of any system failure the craft’s surface tanks can be blown manually, or by air delivery system from the surface, attached to a quick-release coupling on top of the craft by divers. A 150-200kg lead drop weight can be jettisoned to make the craft buoyant. Programmes can be installed in the craft that will automatically surface the craft should there be no input activity from the occupants. On the surface the craft has in the region of 700mm freeboard to minimize the risk of swamping. The wide-bodied configuration makes the craft very stable on the surface and when semi-submerged. All the systems are monitored and controlled by the PLC to ensure that all the correct operating parameters for life support, air supplies, hatches, batteries and vent valves are set before the craft can dive. 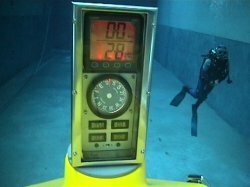 This system allows for a foolproof pre-dive check list to be completed before diving the craft. All the main wiring insulation within the craft is halogen free.